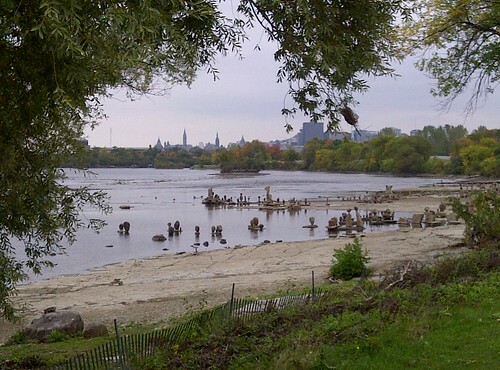 A number of waterways flow through Ottawa and influence its shape; just so, a number of layers of government control its environs, for better or worse. 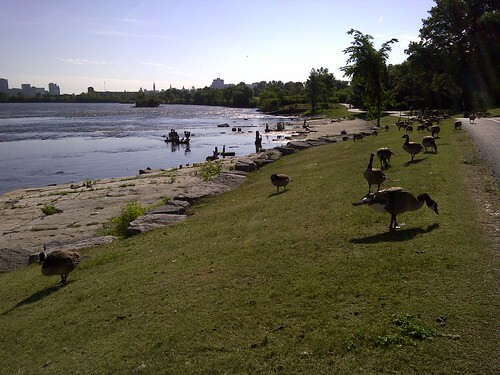 The most unusual of these is the National Capital Commission (NCC), an appointed body that controls specific areas of green space and parkland in the capital region. It is easy to rant about the NCC as being an appointed body rather than elected, but in my opinion this is for the better. A newspaper article last year opined that Ottawa’s waterfront should be opened for development so cheek-by-jowl restaurants could be built along its length, complete with terraces and identikit menus. No doubt the condominium developers would follow in hot pursuit and soon the waterfront would look like that of any other North American city, an impenetrable wall of concrete, asphalt, glass and steel. Fortunately the NCC is insulated from such lunacy and the pressures of developers’ electoral campaign contributions. All of which is to say, limited benevolent dictatorships can have their uses. 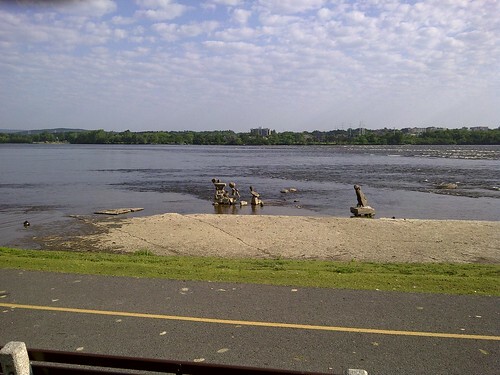 An NCC cycling path follows the shore of the Ottawa River for a respectable distance into the downtown core. In early summer when days were long I sometimes doubled the length of my commute to ride along the river’s edge into the morning sun. 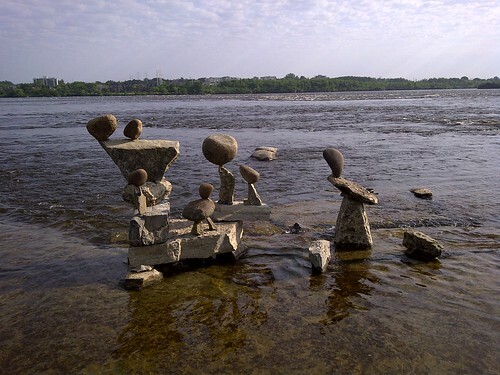 Almost invariably I would pause at Remic Rapids for a minute or two to appreciate the work in progress of John Ceprano, a rock sculptor. For 25 years Ceprano has been erecting sculptures at this spot. I have never met him, but I overheard him this year talking with some casual admirers. I have to be honest. Had I heard him at a social gathering I would have walked away. He talks in a continuous stream-of-conscience manner to which I cannot relate. No wonder I’m not an artist. I just don’t think that way. It is good that we all differ; a world of uniformity would be unbelievably dreary. Ceprano’s sculptures take on a different theme each year. 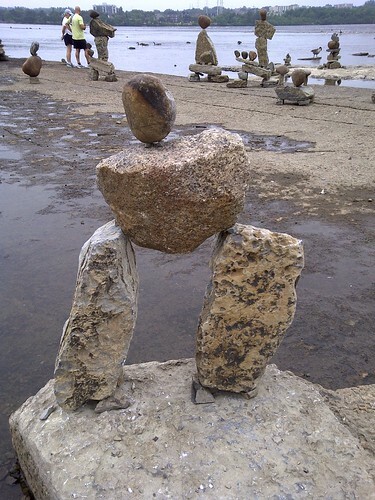 The rocks are all free standing – he uses no reinforcement or adhesives. He shifts them all himself, usually working in deep and often cold water. A couple of years ago a couple of his fingers were crushed in an accident. It was a momentary lapse of concentration, he said. 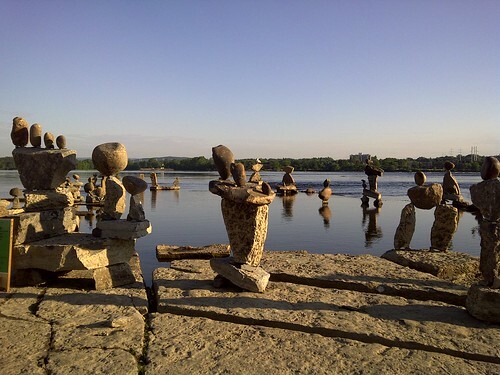 The sculptures start appearing early each year, one by one, and evolve into a community as the season progresses. By this time of year they have become a cohesive whole. Days are short now. 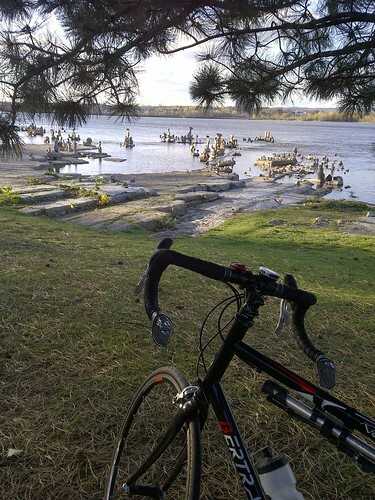 Each day we ride we say to ourselves, “It might be the last.” Soon, when winter comes, the hard grip of ice will pinion the sculptures until the waters rise and they are swept away. The slate will be wiped clean. Next year, John Ceprano will start his sculptures again. We hope. Posted by Kern on November 8th, 2011. Very nice. Agree about developers! A lot of fine scenery has been destroyed by them. If the NCC board is appointed by an elected minister I guess it is accountable in some way. Besides, the mere fact of a body being 'technically' elected does not mean it is properly representative. The National Trust in the UK does a good job and that is only partly elected (and highly respected). I like the sculpture – worth the extended commute. Most modern sculpture is not really 'sculpted' nor does it seem especially popular. There are exceptions, such as our Crosby Beach Statues. Ceprano's looks a real community! Good photos Kern. After the annual clearance it would be interesting to see next year's version. Thanks. The photos are all from my cell phone. The last two are "nose" shots, i.e. my long-fingered gloves wouldn't activate the touch-screen so I had to use my nose. Hence the wobbly horizon (that's my excuse, anyway). Days are short now. Each day we ride we say to ourselves, “It might be the last.” Soon, when winter comes, the hard grip of ice will pinion the sculptures until the waters rise and they are swept away. I'm not usually keen on modern sculpture but they look great. Spectacular! Love these sculptures, borrowed from nature, to return to nature. 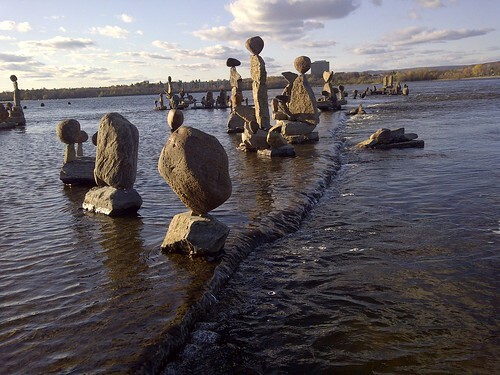 How he manages to balance his scene, as well as balance those rocks is amazing! Poor things wouldnt last long where I live 🙂 Too much sea influence, most of our rivers are not very wide, so they are almost all tidal to a point, then when the rain comes, they are converted into rushing torrents of darkest chocolate. As a 'nose' pic goes, your snout took a good 'un. I am always surprised how good mobile phone cameras are these days. Mary wrote: I am always surprised how good mobile phone cameras are these days. Me too. I'd like some of those bar-end mirrors. Indeed. According to the BBC's Click programme, it's the iPhone 4's "simple 5 megapixel camera that Flickr reports being the most used phone for uploading photos to its site..." beating off higher specification camera phones and dedicated digital cameras.